It’s very appropriate that the last words in this 'unique and dazzling vision of dystopian Britain' are from the wicked witch herself Margaret Thatcher. Directed by Ben Wheatley and adapted from J.G. 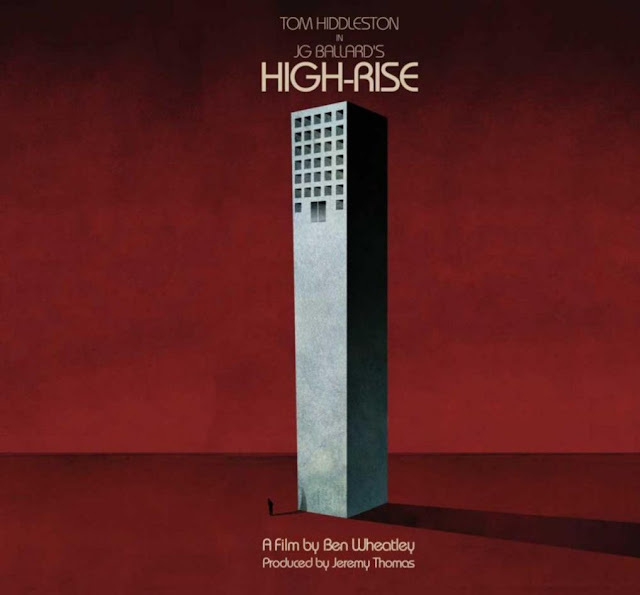 Ballard's 1975 novel of the same name by Amy Jump, High Rise is vividly brought to life from the pages of a book that depicts an architecturally designed 40 story block of luxury flats within which we witness the deterioration of human behaviour. A story about the downfall of social class and the hierarchy that underpins its own weak structure which in turn leads to the release of the inner being and thereafter a collapse into violent chaos invoking a war footing between the haves and have-nots. The whole thing symbolic of today's society where the rich get richer and the poor sink ever lower into the traps that poverty sets. 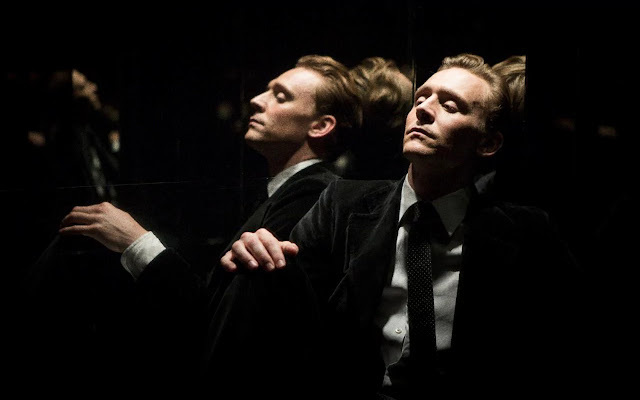 Shot in Belfast in Northern Ireland the film stars Tom Hiddleston, as the doctor of Physiology Robert Laing an eligible bachelor who is the newest resident of one of the luxurious apartments and whose lofty location places him amongst the upper class. Laing quickly settles into high society life and meets the building’s eccentric tenants: Charlotte (Sienna Miller) a seductive bohemian single mum who is his upstairs neighbour; Wilder (Luke Evans), a charismatic documentarian and sexual predator who lives with his long suffering pregnant wife Helen (Elisabeth Moss); and Mr Royal (Jeremy Irons), the reclusive architect who designed the building. Life seems like paradise to the solitude-seeking Laing. But as power outages become more frequent and building flaws emerge, particularly on the lower floors, the regimented social strata begins to crumble and the building becomes a battlefield in a literal class war. This vision of Britain could have been lifted from today's newspaper, the suffering of working families at the hands of the moneyed classes and their political lapdogs, the grim reality of people’s lives and the decaying political system that blames the weakest in society for the countries problems. We now follow a world system that sinks further to the extreme right and will decay even further unless the 'high rise' is demolished! 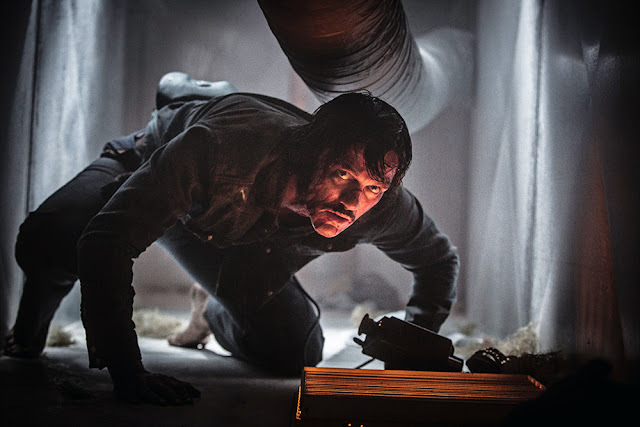 I digress from the movie, but that's the affect that this movie has on me, and I imagine many other people of sound mind. The characters are vivid and real, the soundtrack is exceptional, especially the fantastic haunting interpretation of the 1975 Abba hit SOS by Portishead and of course Ballard's story interpreted by Wheatley and Jump is strikingly graphic. If like me you missed this at the cinema it’s now available on DVD. Enjoy while your still able too my friends - its getting ever blacker outside.